he Wrights' third glider was the world's first aircraft with three-axis aerodynamic control; that is, it could be made to pitch, roll, and yaw in flight with movable surfaces. 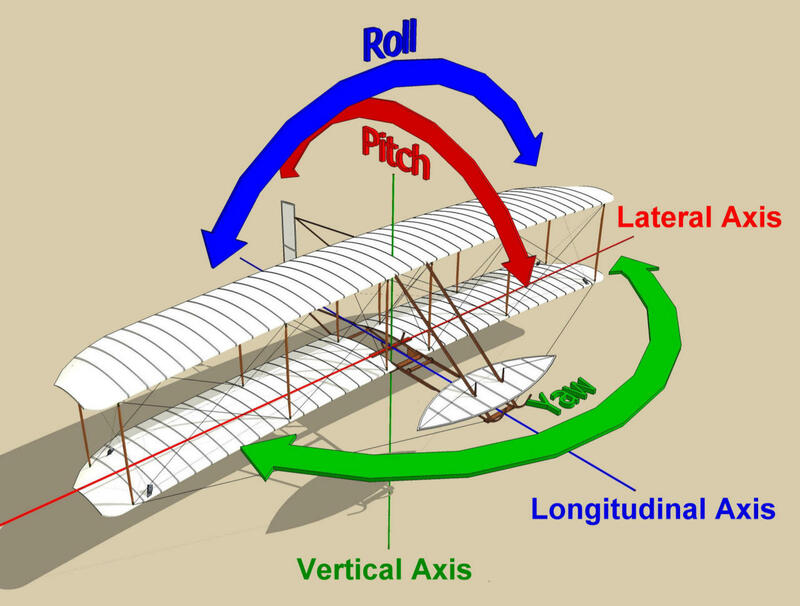 The forward elevator pitched the nose of the glider up and down around its lateral axis; the wing-warping rolled the wings of the glider around its longitudinal axis, and a rear rudder yawed the nose right and left around the vertical axis. 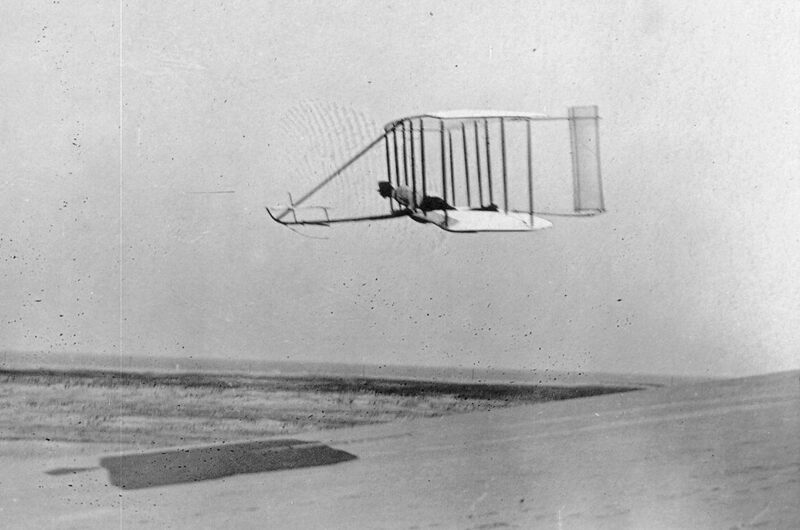 This was the basis for the Wrights' pioneer "flying machine" patent in 1906. 112 lbs (50.8 kg) weight. The front elevator was controlled by rotating a horizontal bar in front of the pilot. The pilot moved his body right or left in a novel "hip cradle" to warp the wings. The rudder was originally two fixed vanes that served only as a vertical stabilizer; it did not move at all. But in early October, the Wrights discarded one of the vanes and converted the remaining one to a movable rudder. 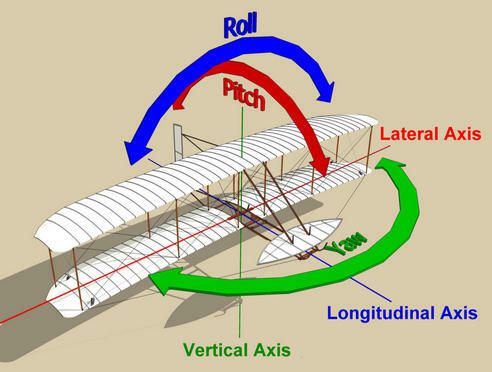 The movement of this rudder was tied to the hip cradle, since both roll and yaw control were needed when entering a turn or leveling the wings. These controls remained coupled on Wright aircraft until 1905. 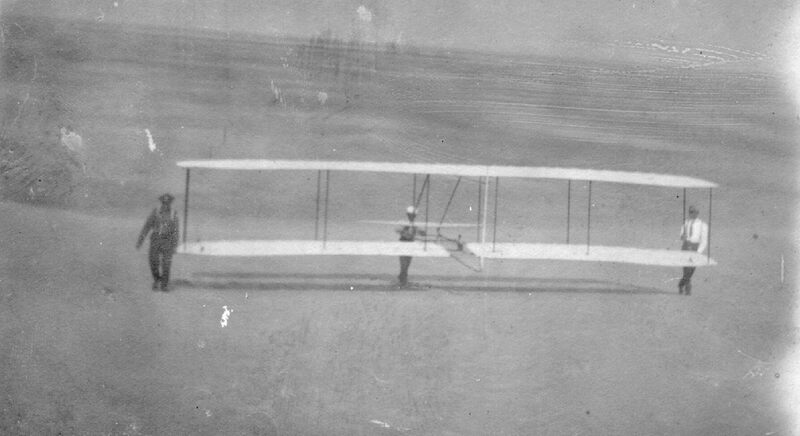 Wrights flew their third glider at Kitty Hawk almost 1000 times during September and October of 1902, making flights that stretched up to 622 feet and last as long as 26 seconds. 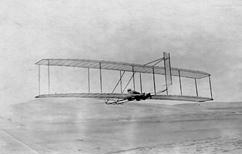 They stored the glider at Kitty Hawk over the winter, then used it again in 1903 to hone their flying skills. 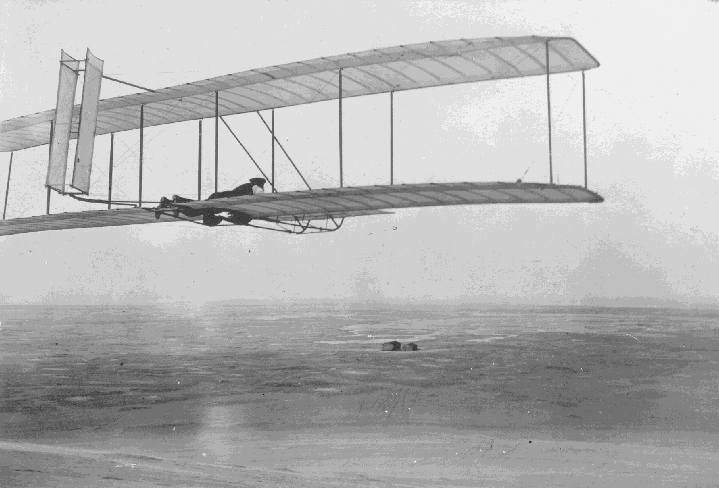 They made another 1000 flights between September and November of 1903, one of which lasted for 43 seconds. During this time, they replaced the single vertical rudder with a double rudder. 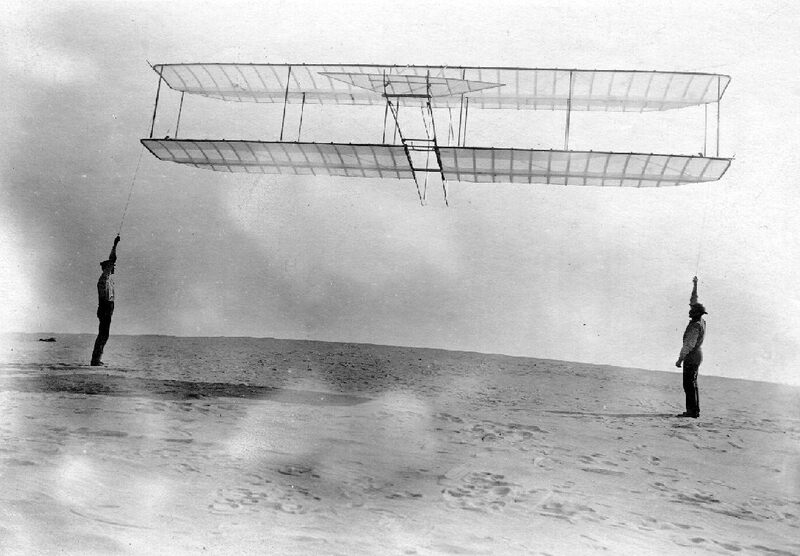 The 1902 glider was abandoned at Kitty Hawk after their 1903 flying season. A single wingtip is all that remains of this aircraft; it is on display at the Smithsonian Air & Space Museum. See more images of the 1902 Wright Glider in our Virtual Hangar. McFarland, 1953, p 1185-7, drawing 1186, plates 39-52, 56-59, 62. McFarland, Marvin W. (ed) The papers of Wilbur and Orville Wright. McGraw-Hill Book Co., New York, 1953, p 1185-7; drawing 1186, plates 39-52, 56-59, 62. 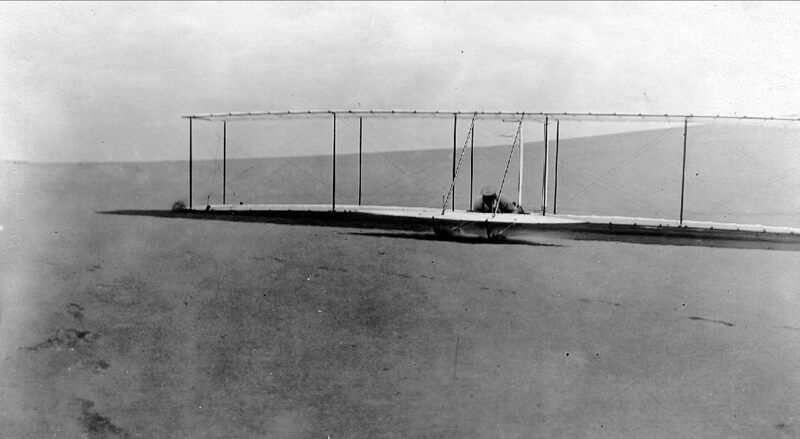 The 1902 Wright glider was the first aircraft with three-axis control. 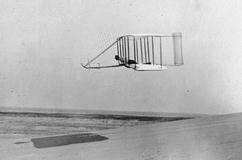 As with all their gliders, the Wright carefully measured the lift and drag produced by the 1902 glider while flying it as a kite. 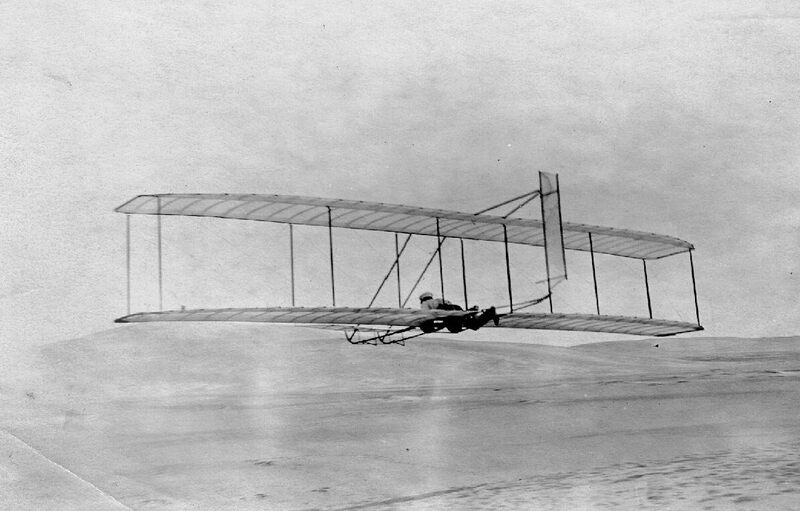 The 1902 glider was the first Wright flying machine to have a tail. At first, this was only a fixed vertical stabilizer with twin vanes, unable to move. But the Wrights found this caused them grief when they tried to turn or level the wings. 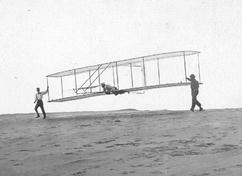 The right wing has dipped on the glider and Orville is attempting to bring the aircraft back to level flight. He has shifted his hips to the left, warping the wings and turning the rudder at the same time. With a fixed tail, this would have been a potentially dangerous maneuver. Wilbur raises the nose of the glider to stretch his glide by moving the elevator ever-so slightly. 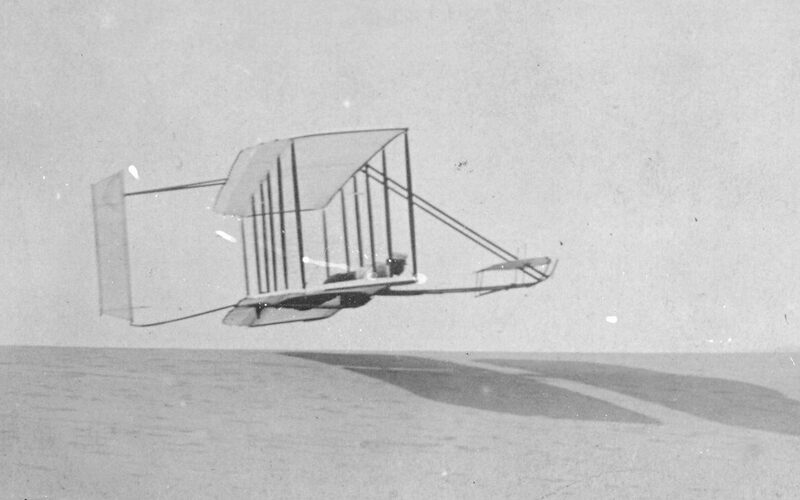 In 1903, while they were readying their powered Flyer I, the Wrights modified the tail of the 1902 glider again, adding a second movable vane to give the rudder more authority. They practiced with this, honing their piloting skills. Carrying the 1902 glider us a dune in preparation for a launch. Launching the glider. 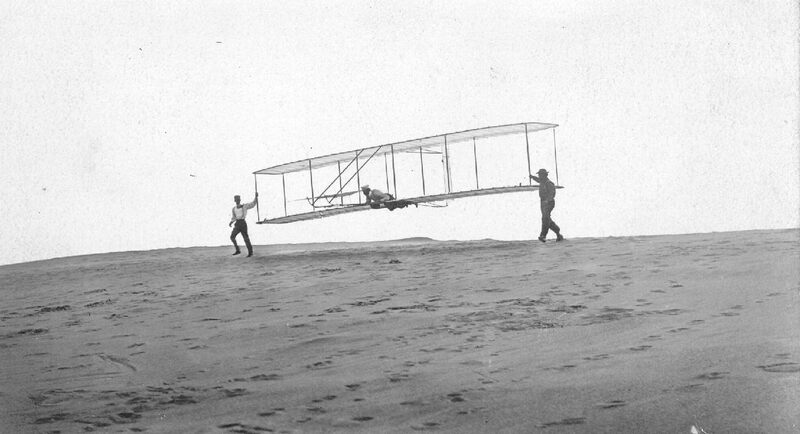 Orville is at the controls (center), while Wilbur (left) and Dan Tate (right) run the glider forward into the wind. The Wrights modified the fixed tail, removing a vane and mounting the remaining one so it could pivot right and left. For the first time, they were able to roll into a turn or bring the wings back to level safely. 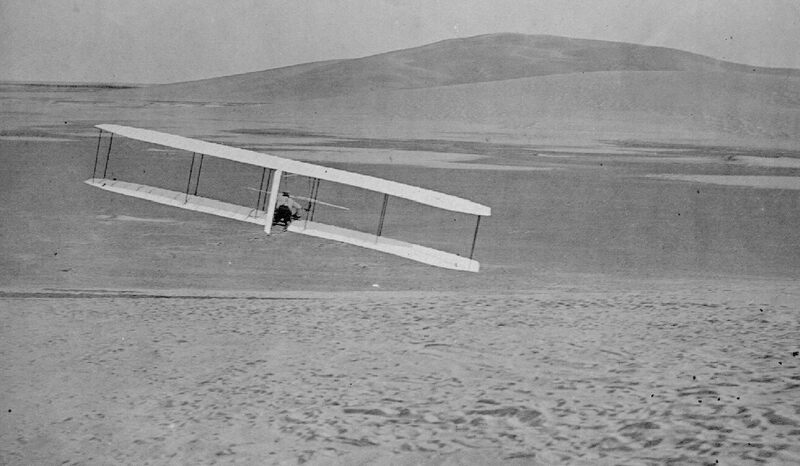 Orville brings the 1902 glider in for a landing in the soft sand. The anhedral (wing droop) kept the wing tips close to the ground during this maneuver. Without the droop, the Wrights found a side gust could catch a wing and overturn the glider.